Bobbie is a teacher and freelance photographer living in South London. I’ve been cycling to work for about 10 years. I started to use the bike as my main mode of transport at university. I had a cute (but rickety!) bike named ‘Betty’ when I first started riding regularly then switched to a hybrid bike, which was a great improvement. I am on my third bike now (also a hybrid). I was pretty nervous at first but quickly began to enjoy the freedom of not being stuck in traffic plus the obvious health and environmental benefits. I think I’ve always been the same in my riding style – knowing my rights on the road and just going for it but also erring on the side of caution (especially around buses and lorries). Everyone is fighting for space on the roads! There are areas of London I will not cycle through such as King’s Cross, London Bridge and Elephant and Castle. I keep things fairly local. My journey varies but it’s usually about 8 and a half miles there and back. Most days, I am able to cycle through a park, which is really nice. On the other days, I go through very heavy rush hour traffic, which is not so nice. My tip for people starting to cycle to work would be to try and find ways of incorporating some quieter roads or green spaces on your route. If not on your way in to work, then on the way home. Something to look forward to after a long day! I wear leggings then change into trousers at work. I always wear a helmet, winter or summer cycling gloves and a waterproof jacket in wet weather. I also wear an anti-pollution mask when I know I’ll be cycling in heavy traffic. As for repairs and maintenance – I have a foot pump at home to pump up the bike tyres but anything else is done by my (excellent) local repair shop. find quieter roads or green spaces Plot your cycle route with www.cyclestreets.net or find a low-pollution route with the City Air app. 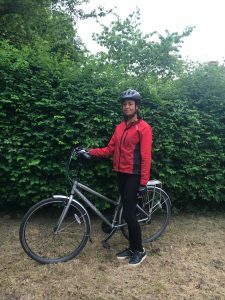 knowing my rights on the road … erring on the side of caution Get free cycle training on the road, and help in planning a route. For anyone who lives, works or studies in Southwark, details are here or ask your local borough.